Blindness and Vision Loss Spike by 23 Percent in the U.S.
SAN FRANCISCO, CA--(Marketwire - Sep 12, 2012) - Blindness and vision impairment are on the rise in the United States. A recent report by Prevent Blindness America indicates that, since the year 2000, incidence of blindness and vision impairment has increased by 23 percent among Americans age 40 and older.1 However, most blindness in this country is preventable with proper eye care. The American Academy of Ophthalmology and EyeCare America urge Americans to get regular eye exams to better prevent and detect sight-stealing eye diseases. The prevalence of diabetic retinopathy increased by 89 percent. The frequency of age-related macular degeneration (AMD) increased by 25 percent. The incidence of glaucoma increased by 22 percent. As baby-boomers continue to age, the incidence of age-related eye disease is also expected to continue to increase. Currently, people age 80 and older constitute only 8 percent of the population, but account for 69 percent of all cases of blindness.3 Early detection and treatment by an ophthalmologist -- an eye medical doctor -- may help prevent and in some cases, such as cataracts, even reverse vision loss. Many seniors age 65 and older may qualify for an eye exam and up to 1 year of care at no out-of-pocket-cost through EyeCare America, a public service program of the Foundation of the American Academy of Ophthalmology. EyeCare America matches qualifying patients age 65 and older with an ophthalmologist who provides a comprehensive medical eye examination. EyeCare America is co-sponsored by the Knights Templar Eye Foundation, Inc, with additional support from Alcon. To see if you or a loved one is eligible, visit the online referral center at www.eyecareamerica.org. "Regular eye exams are imperative to detect and treat eye diseases and prevent serious vision loss," said Richard P. Mills, M.D., chairman of EyeCare America. "This is especially true for people age 65 and older who are at increased risk for eye diseases. That's why EyeCare America is so focused on providing access to eye care, and we hope that fewer people will suffer from preventable causes of blindness as a result." To learn more about EyeCare America or to find out if you or a loved one qualifies for the program, visit www.eyecareamerica.org. 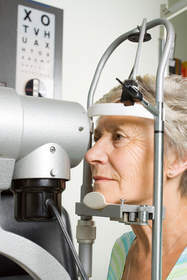 Learn more about eye diseases and conditions, and keeping your eyes healthy at www.geteyesmart.org. The American Academy of Ophthalmology is the world's largest association of eye physicians and surgeons -- Eye M.D.s -- with more than 32,000 members worldwide. Eye health care is provided by the three "O's" -- ophthalmologists, optometrists, and opticians. It is the ophthalmologist, or Eye M.D., who can treat it all: eye diseases, infections and injuries, and perform eye surgery. For more information, visit www.aao.org. The Academy's EyeSmart® public education program educates the public about the importance of eye health and empowers them to preserve their healthy vision, by providing the most trustworthy and medically accurate information about eye diseases, conditions and injuries. Visit www.geteyesmart.org to learn more. Established in 1985, EyeCare America, a public service program of the Foundation of the American Academy of Ophthalmology, is committed to the preservation of sight, accomplishing its mission through public service and education. EyeCare America provides year-round eye care services to medically underserved seniors and those at increased risk for eye disease through its corps of nearly 7,000 volunteer ophthalmologists dedicated to serving their communities. More than 90 percent of the care made available is provided at no out-of-pocket cost to the patients. Since its inception, EyeCare America has helped more than 1.7 million people. More information can be found at: www.eyecareamerica.org. 1 Prevent Blindness America, Vision Problems in the U.S. Report, June 2012. Accessed at http://www.visionproblemsus.org/. 2 Prevent Blindness America, Vision Problems in the U.S. Report, June 2012. Accessed at http://www.visionproblemsus.org/. Eye M.D.s discuss their passion for this medical specialty and the exciting new developments that mean better care for patients.